A Crow's Year from the Crows.net Project. We will be regularly posting information on the type of crow activities you are most likely to observe month by month. As well as general information, we will also try to post current reports sent in by site visitors. You should be aware that threre may be some variation in the timing of lifecycle events based on location within the North American Continent. Crows.net is located in Connecticut, U.S.A., which is in U.S.D.A. Growing Zone 5. You can check your growing zone in most seed catalogs or on line. If you are in a colder zone, events might happen a bit later, in warmer zones, earlier. Scroll down to the appropriate month. By the middle of June, in Northeastern Connecticut, the young crows have left the nest and the normal morning crow sounds have returned. Adult and young crows can be heard calling back and forth to each other and a variety of unusual sounding vocalizations may be heard as the young crows experiment with possible combinations of sounds. By early May, in Northeastern Connecticut, crows should have laid eggs and the female should be incubating them. Generally from three to seven eggs are laid and incubation takes about eighteen days. After hatching, the young birds remain in the nest from between thirty to forty days. During this time crows will tend to be very quiet, avoiding unnecessary noise that might attract predators to the nests. You probably will miss the normal morning "cawrus" of crow vocalizations, hearing perhaps only an occasional single caw. The female usually remains at the nest more or less full-time and the babies are fed by the adult male and sometimes by "helper" crows, younger birds from previous years' nests. Young are either fed directly by the birds bringing the food, or it may be passed to the mother, who then feeds the nestlings. As the days lengthen and spring-like days come more frequently, nesting activity may start in warmer parts of the continent. Crows may be seen carrying nesting material, possibly copulating, being involved in brief "flurry fights" over territory or dominance, and may be heard making various vocalizations other than the familiar cawing. Clicking or rattling sounds, soft "coo-ah" noises and a variety of others seem to be associated with mating activities, though what their actual role is remains unclear. 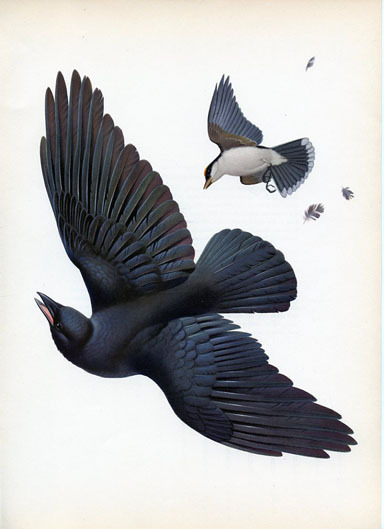 The actual timing of nest building and egg laying varies with location and climatic conditions, as well as with the particular temperature range in any given year. Generally crows are among the earliest birds to begin the nesting process, so if you see any other birds involved in nest building or sitting on nests, you can be pretty sure that your local crows are at least as far along in the process. During the first few days of nesting, the female may be quite noisy, vocalizing short somewhat raucous calls frequently, often several times a minute for long periods of time. Later on, after eggs are laid, the mating pair becomes much quieter and more secretive, so as to not give away the nest location to potential predators. If suddenly the crow noises in your neighborhood diminish dramatically and if crows come silently to your feeding station, without the usual discussion over whether its safe to dine, then you can be relatively certain that there are eggs or young birds in the nest. February is a slow time in the crow's year. Survival through the short, cold days is the main activity. Families are still together, hunting for food, usually on their territories, and traveling to the roost most nights. During the day they can be very vocal as they spread out across the territory and keep in touch regarding their location and anything interesting they find. Soon, depending on geographical location, the nesting season will begin shortly and very noticeable changes in behavior will take place. The large communal roosts are now forming regularly every night in hundreds of locations throughout the continent. The odds are, if there are crows in your area, or if you see flights of crows in the later afternoon, there is a crow roost somewhere within a maximum of about twenty miles from your location. The remarkable thing is that it is quite possible for a gigantic roost to be located a relatively short distance away from a person's home or workplace, without that person ever knowing that its there. This is the time when the big communal roosts are forming. From late Fall through early Spring, large number of crows will be gathering together in the evenings to spend the night in roosts that may contain anywhere from several hundred to tens of thousands of crows. Crows from a fairly large geographical area, covering a circle with perhaps a 20 mile or larger radius, will begin flying in the late afternoon or early evening towards a central roost location. It appears that in many cases, crows from various parts of the area served by the roost will stop at one or more staging area along the way where groups of crows gather and remain a short time before proceeding to the main roost. To use a human analogy, one might say that families of crows proceed to staging areas, where the clans gather, before flying on to gather as a tribe at the roost. If one is near the roost as evening sets in, one will observe discrete groups of crows continuously flying towards the roost from all directions. Although roosts may occur in a wide variety of surroundings, most commonly they are found in areas with large, mature trees not growing to densely, relatively near a water source such as a river or lake. In cities favorite areas seem to be cemetaries, college campuses, parks, malls, railroad yards, and old industrial areas. Often, rather than being in a fixed location, a roost may move over time around in a seemingly random pattern, never getting very far away from a central point. It may take quite some time for the roost to settle down at night. Sometimes all the birds might suddenly take to the air and the whole roost move a short distance away. There's always constant excitement as individual birds seem to challenge each other for positions and others engage in mock "dog fights" or aerobatics. All in all watching a roost as night falls can be a remarkably powerful experience. No human knows the exact reason crows gather in such numbers in winter but it is likely that it serves a major social role as well as offering a measure of protection both from predators and the elements. The precise composition of the population of the roosts is not known either, but it appears that not all crows from a given area go to the roost every night. From observations, it appears that at least some older mated crows remain in their territories at least some nights, since the have been observed there earlier than they could have possibly have been had they flown the distance from the closest roost. Crows.net postulates that the majority of crows in roosts are younger unmated birds without nesting territories and that the mated pairs visit the roosts less regularly. This is the time of the year when crows.net receives the largest number of reports on crow vocalizations as the socialization process of the young crows continues. It is also the time when the crows begin to form small roosting groups in the evening. Observers may note flights of crows all heading in one direction in late afternoon/evening or gathering in a group in the treetops. These gatherings are generally much smaller that the large winter communal roosts and we presume they serve as a sort of training ground for the sort of social interactions that occur later on when hundreds or thousands of crows gather in one location. One would also presume that the smaller roosts generally are comprised largely of crows closely related to each other by blood or mating and occupying territories adjourning or very close to each other. Fall Roosting Report by Michael Westerfield. As the weather grows colder and the leaves begin to fall here in Northeastern Connecticut, the local crows begin showing signs that the formation of the large winter roost is not far off in time. During the spring, summer and early fall, crow life tends to be centered around small family groups which forage together during the day and roost together at night, usually separate from other crow family groups. In winter, however, most crows will roost at night in large communal roosts, often containing many thousands of birds, who gather together from a wide geographical area. At this time of year, the behavior is often somewhere in between. When I walk outside anywhere from a half hour before sunset until the last light fades, if I pause and listen, usually I'll hear the calling of crows from somewhere in the vicinity. If I stand watching the sky, almost invariably I'll soon see small groups of crows flying overhead sometimes all heading in the same direction and sometimes seeming to mill about, riding the currents of air with an appearance partly of purpose and partly of pleasure. The interesting thing about watching these crows is that, unlike many flocking birds, starlings and the like, they don't move as a coordinated whole; each bird in a group is busy interacting with the others on an individual basis. A pair will come over and you'll see then swooping at and away from each other like children playing tag. One member of a group might break away and join another group or double back the way it came. When the weather is still mild, it seems that the birds here will gather in a number of smaller local roosts which will eventually coalesce into the larger winter gathering place. As one watches the crows shifting from place to place on a fall evening, I can't help thinking that some sort of democratic process is going on as the birds settle on an area in which to spend the night. There is a great deal of noisy flying about, with the birds settling first in one area, then some breaking away and moving to another nearby location. Individual birds may move back and forth between two or more groups and the whole mass of birds may rise into the air and settle again, or move, or divide into other smaller groups. This will go on until the light finally fades and, somehow, the whole flock has settled on one roosting area. Roosting areas tend to be located where there are large, mature trees with open spaces in between. In cities and towns, cemeteries, college campuses, malls with adjacent trees, old rail yards, and older neighborhoods and industrial areas, and the like tend to be favored. If there is a river or other body of water nearby, its a definite plus. The crows generally settle on the branches of trees which have already lost their leaves, or on the uppermost branches of those that haven't, so it is easy to spot their silhouettes against the still bright sky. At this time of year, the temporary roosts may be more loosely organized and spread out over a wider area that those in colder weather. If there are crows in your neighborhood throughout the year, it's likely that there will be one of these temporary fall roosts nearby. The amazing thing about these roosts, and even some of the gigantic winter roosts, is that one can be fairly nearby and most folks will be totally oblivious to its presence. I suppose it has to do with the timing, when people are still at work, commuting home, or just settling in for a long autumn evening. Probably the most common reason folks notice crow roosts relates to crow droppings on their cars or sidewalks in the morning. If your car is clean, and you want to find your local roost, just take a walk in the late afternoon – with your ears free of noise making devices. Choose an area with large, old trees and open spaces. Watch and listen for crows passing by up above and move in the general direction in which they are moving and, if you are lucky, you might just arrive at the place the crows will choose to spend the night. You’ll know it when you get there! As fall draws closer and the young of the year crows gain more experience, there seems to be more interaction between families of crows occupying territories in the same area. Sometimes these take the form of either serious or more playful bouts of crows chasing each other with a great deal of vocalizing going on in the process. Other times two or more groups may be seen feeding in close proximity to each other without any conflict. Often groups of several crows may be seen flying together usually with considerable vocalization between the birds. Groups of older, unmated crows may also be seen feeding together or "playing tag" in the air. Blustery fall days seem particularly suited for these wild games of crow tag. This is the time of year when you might hear unusual crow vocalizations, clicking or rattling sounds rather like the distress/challenge noise of a gray squirrel, soft coos, and possibly even long strings of complicated sound patterns. These very frequently are made by the young of the year crows, and possibly serve a similar purpose in the language learning process as "baby talk" does in humans. We have observed young crows walking along a rooftop by themselves and producing long rambling strings of sound for no apparent purpose. The basic crow families of perhaps 3 to 7 or 8 birds are still remaining together and the young may be more bold and visible in hunting for their own food. In mid-August the young crows are learning how to find food and generally fend for themselves. You may often hear raucous calls early in the morning as the young and parents, and sometimes older siblings from previous years, call back and forth to each other. Parents will be leaving the youngsters for longer periods of time, but will also often appear with them to feed. The young will still try to beg food from their parents or older siblings and the older crows will occasionally still feed them. The parents and young crows will stay together as a family unit usually until the next nesting season, and sometimes much longer. Observations: In the winter I was feeding Blue Jays peanuts; I noticed one day 2 adult crows landed on the balcony where I kept a bird feeder. They approached the feeder and started taking peanuts. I thought that they must be pretty hungry so I started throwing them pieces of bread. By now, the fledglings have all left the nest and have learned to fly. The parents and offspring remain together as a family unit while the youngsters receive training in basic survival skills. The most obvious sign of this activity is the often incessant calling of the young crows, and the occasional responses of the parents, which is particularly obvious following the rather quiet nesting period. One of the key lessons taught by the parents to the young crows at this time is "staying put". They must learn to remain in place when their parents leave them, and not move until the parents return or give them "the all clear" to join them. When the young crows are left alone, they will periodically vocalize, usually two or three caws every so often. This is informing the parents of there whereabouts. It will also inform you where to look for young crows at this time of year. When the parents return, you will frequently hear a much more frenzied and higher pitched type of vocalization, sounding something like human infants crying, which is the crow youngsters begging their parents to feed them. Today was the first day I saw the three recently-hatched crows in "flight training". They have been to drink from the gutters twice this morning. The adults also took them to the koi pond to stand in the falls and drink. One of the younguns took a tumble to the lower fall, and the five birds all left hastily. The birds have been in a large Douglas fir most of the morning, with short flights occuring about every 15 minutes. Noted that the adults land in a nearby tree with food in their mouths; the little ones join them. July 26, 2006, in responce to crows.net comments on "staying put". The "stay put" does seem to be a big part of training. There are four places where I see the parents put the babes for playpen time. One is the roof of this home; one the nest tree; one the fence bordering the pond; the fourth, a tree near a border of evergreens. All four places have excellent visibility from multiple places. When waiting, the young uns have a very distinctive caw; and all three have a bit different sound. Return to Site Contents of the Crows.net Project. © Copyright 1999 - 2010. Michael J. Westerfield. All Rights Reserved.